In a world where changing eating habits of consumers worldwide are boosting the demand for spices, India’s spice industry is making the most of the immense growth potential. India is the largest producer, consumer and exporter of spices. Technology advancements, R&D and value-added, readymade spice mixes are propelling the spice industry forward. The support provided by the Spice Board of India further contributes to the establishment and conformance of quality standards which in turn, positively impact spice exports from India. Another powder that’s growing in both local consumption and international demand is skimmed milk powder. Besides creative marketing strategies to ensure high brand recall, manufacturers are investing in modern packaging that protects the purity, freshness and flavor of the contents, facilitates ease of transportation and storage, and stands out on the retail shelf. Enter Nichrome’s powder packaging machines. Serving the needs of Indian food processors since 1977, Nichrome offers hi-tech packaging solutions to a large base of satisfied customers in India. With their pioneering Vertical-Form-Fill-Seal machines for powder packaging, Nichrome is the preferred innovative packaging solution provider to many top brands in India — not just for spices but for many other edible powders. Everest, Swastik, MDH, Sakthi, Sunrise, Cookme, Super Nova are just some the spice manufacturers who trust their products to the proven technology of Nichrome’s sachet filling machines. For milk powder packaging, companies such as Amul, Britannia, Govardhan, Visakha Dairy and Pran prefer Nichrome’s packing solutions. Nichrome’s powder packaging machines are versatile work horses, working with speed, efficiency and accuracy as coffee packaging machines, tea packaging machines and spice packaging machines. 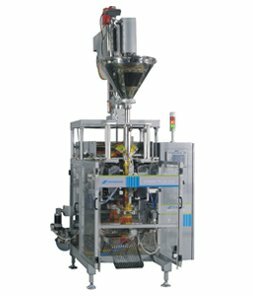 Nichrome’s range of powder packaging machines includes both Vertical Form-Fill-Seal (VFFS) and Horizontal Form-Fill-Seal (HFFS) machines. Besides spices, coffee, atta (flour), milk powder, nutraceuticals, soup powders, premixes and instant mixes, Nichrome also offers specific solutions for packing chemicals and detergents. The containers are specifically selected so that chemicals won’t react with them and become hazardous. Leading in speed and efficiency is the Maxima 400. Ideal for sachet packaging of powders, the Maxima 400 delivers high productivity in a minimum footprint. Besides being able to pack 2 different products in different pouch sizes, Maxima 400 also offers filler options such as Auger, Twin Cup Filler, EWF, Twin Discharge MHW & Piston Filler. Single pouches or a perforated chain of pouches can be produced on this machine. What’s more, Nichrome also provides integrated post-packaging systems which can be customized according to the customer site and need!